Weekend Kits Blog: Christmas Card Kit Giveaway at Weekend Kits! Christmas Card Kit Giveaway at Weekend Kits! The November Craft Kit Giveaway has ended - be sure to check back for future giveaways! The winner of the November Craft Kit Giveaway is VermontPines. Congratulations! Please Contact Us with your shipping info and we'll have your prize out to you right away. Thanks to everyone who entered the giveaway and joined us on our Facebook page. Please stop by now & then for updates on new product arrivals, promotions, and to hear about our next giveaway! It's time for the November Craft Kit Giveaway at Weekend Kits. One winner will be randomly selected to win the Christmas Cheer Card Making Kit from TPC Studio. This is a complete card making kit with everything you need to make 25 Christmas cards! Kit includes 25 folded cards, 60 self adhesive stickers, 1 sheet adhesive jewels, 2 yards ribbon, 25 envelope liners, 25 envelopes, and 1 instruction sheet. Making your own Christmas cards is a fun holiday craft activity and kits like this make it easy by bringing together all the coordinated card making supplies you need to get started right away! Visit the Card Making Kits section of the store to see our complete selection of card making kits for holiday & everyday greetings. 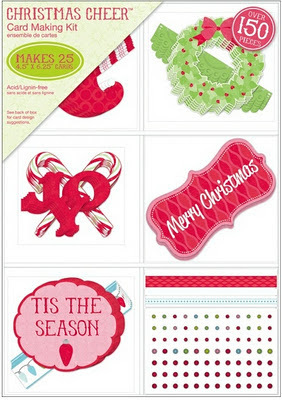 1) Leave a comment here letting us know your favorite kit in the Christmas Craft Kits section of the store. 2) Like us on Facebook and leave a comment here letting us know you did. If you already like us on Facebook, just leave another comment letting us know and this will count as a bonus entry. 3) Press the "Like" button at the top or bottom of this blog post and leave another comment letting us know you did. - You have until Tuesday, November 22 at 12:00pm (EDT) to enter. - One winner will be chosen using Random.org's number generator. - Open to US & Canada shipping addresses only. - You must be 18 years or older to enter. The winner will be announced here on Wednesday, November 23. We don't collect email contact info at time of entry, so it's important to check back here to see if you won. It might be helpful to add a reminder to your calendar. Updates are always posted on our Facebook page, so if you've joined us there, you're set. If you include email info in your profile or within your comment, we'll send you an email if you win. Winners will have 3 days to Contact Us with their shipping info to claim their prize. If not claimed within 3 days, a new winner will be drawn. Weekend Kits specializes in modern DIY craft kits for adults, teens, and kids. Our goal is to help make crafting convenient, easy, and most of all FUN for beginners & all skill levels. Good luck and thanks for visiting the Weekend Kits blog! I "like" you on Facebook! Thanks!! I love Felt Christmas Ornaments Kit - Warm Hands ! The mittens are just adorable ! Especially the little patterns ! Great website ! Oh this was not as easy as I thought! So many beautiful kits, but overall, I think Felt Christmas Stocking Kit - Bucilla - Candy Snowman is the sweetest! oooh Im sorry, I did not read the instructions properly.. I cant enter, but still, beautiful kits. Now off to see if I can order from Aus! We have our winner - see post for details. Thanks to everyone who entered and be sure to check back now & then for future giveaways! Felt Christmas Ornament Kits - DIY Tree Trimming!